If you’ve ever gone outside before sunrise, you’ve likely noticed dew on the grass or on your car windows. This is condensation. While we may have learned the basics of this naturally-occurring phenomenon in science class, we may need a quick refresher. Condensation occurs when there’s more water vapor (the invisible, gaseous phase of water) than the air can hold. When the water vapor is cooled off or compressed to its saturation limit—at which point the vapor’s molecular density reaches it maximum threshold—it turns into liquid. Warm air can hold more moisture, but as it cools it reaches its saturation limit and water droplets form. While not a problem on the grass or your car (once you wipe the water away), condensation on metal panels CAN be a problem. The good news is there’s a simple solution. What causes condensation on metal panels? 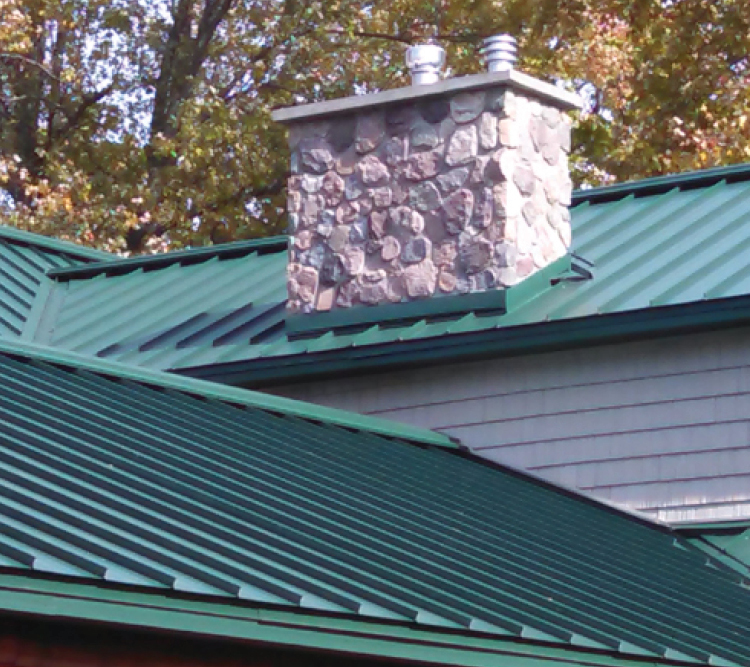 When temperature and humidity conditions reach dew point, moisture can condense on the underside of metal roofing and potentially cause water damage to the inside of your building. 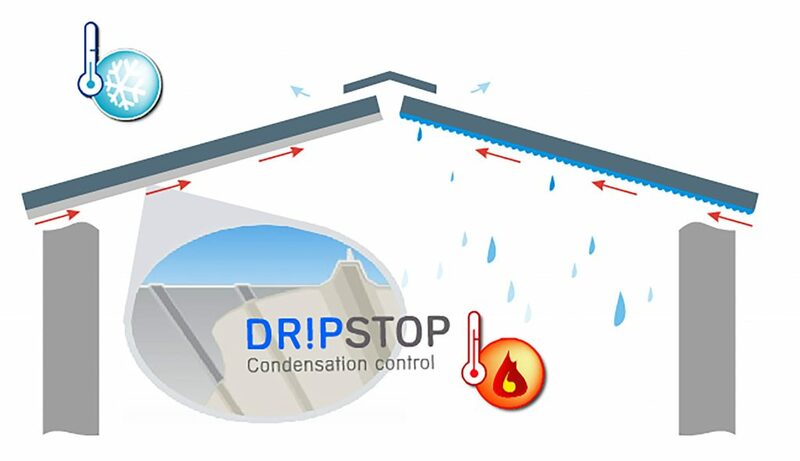 Those drips from ceilings and surface moisture occur when warm air comes in contact with the cooler roofline or walls. High interior humidity—a common cause of condensation in metal buildings—can result from heating and air conditioning systems, how you use your building, gas-fired heating components, improper construction techniques, or even human respiration, as these all give off moisture vapor. Corrosion of metal components, even on surface-treated metal: When exposed to moisture, metal components can oxidize and weaken, decreasing the life of your building. Note: The probability of significant problems will depend on thelocation and you of your building. Controlling Condensation: What is the Solution? Traditionally, condensation is managed by insulating the metal roof so that the panel temperature never reaches the dew point. This is often accomplished using vinyl-backed fiberglass insulation to prevent humid air from coming into contact with the cooler metal roof (which may be at or below the dew point). If you are heating or cooling a building, adding insulation would certainly be an idea worth consideration. But what about buildings that aren’t heated or cooled? If you don’t want to install vinyl-backed insulation, what other options do you have? One patented CCM (condensation control membrane) product on the market, Drip Stop (manufactured by ABC) is a felt-like material with a rubber backer that can be applied to the back side of metal panels. The material literally traps and holds the moisture that results as condensation occurs. When conditions change, the ambient air temperature usually rises, thereby raising the dew point. The moisture is then released from the DripStop material back into the air in the form of normal humidity. Drip Stop can be applied to the back of metal coils (either Galvalume® Plus or painted) and then the metal can be roll-formed onto panels. What are the benefits of this alternative condensation control method? Durability: DripStop is a very tough, light gray anti-condensation felt that is not susceptible to ripping, tearing or deterioration unlike standard insulation and vapor barriers. Low Maintenance: Drip Stop resists dirt and grime, is antimicrobial and is very easy to clean with a hose or pressure washer. Corrosion Protection: The rubber backer on the material helps protect the back side of the panel from corrosion (although there is no protection at the panel’s cut edges). Easy to Handle: There is no need to roll a vapor barrier over purlins and then seal with tape, which can reduce labor hours and cost. Additionally, the use of Drip Stop is not hindered by windy conditions. Safety and Insurance: The material is approved for smoke generation and flame spread per UL® 723 for insurance specifications. Acoustic Benefits: Drip Stop helps dampen sound from either inside or outside the building. Versatility: Drip Stop is approved for use in residences, warehouses, industrial plants, sports arenas, schools, storage buildings, garages, animal confinement facilities and more. Cost-Savings: Drip Stop is up to 25 percent lower in cost versus traditional solutions. Warranty-Backed: Drip Stop features a 20-year adhesion warranty to ensure longevity. There’s really no need for the damaging effects of condensation to put a damper on your metal building project. With a simple solution like DripStop, there’s a better way to protect your assets and prevent costly and time-consuming repairs. For more information on Drip Stop and how it can be applied to ABC’s PBR, Imperial Rib® and Retro-R® panels, visit our website or contact your local sales representative.